Washington DC (VNA) – Minister-Chairman of the Government Office Mai Tien Dung appreciated the US Agency for International Development (USAID) increasing its support for Vietnam over the past years during a working session with the agency’s leaders in Washington DC, the US, on April 10. Talking to USAID Administrator Mark Green, Minister Dung highlighted the nearly-two-decade cooperation between the Vietnamese Government Office and USAID and thanked the agency for implementing a number of programmes and projects funded through non-refundable official development assistance in Vietnam, including the environmental remediation of dioxin contamination at Da Nang and Bien Hoa airports and the Provincial Competitiveness Index assessment. He spoke highly of USAID’s increase of its budget for supporting Vietnam by 40 percent over the last three years. 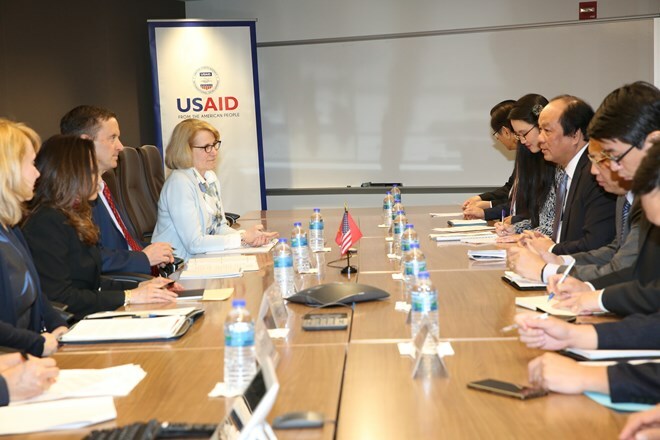 The official called on USAID to continue assisting the Vietnamese Government in institutional reforms and state governance, including building an e-government. Dung expressed his belief that bilateral cooperation will continue developing through the Country Development Cooperation Strategy in Vietnam for 2020-2024, which is being built by USAID. He also asked it to keep conferring with the Vietnamese side during the strategy making process so that this strategy can have the best assistance orientation. For his part, USAID Administrator Green said there are many cooperation projects between Vietnam and his agency, including those on addressing war consequences. The best way to enhance the two sides’ cooperation is to work more on concrete projects so as to attain better results in the future, which will help further promote Vietnam-US relations, according to him. Green said the two sides can further discuss cooperation fields for the next five years, adding that there are many things interested by both Vietnam and USAID. Also on April 10, Minister Dung attended a roundtable meeting on investment policy with the Asia Group, its members and partners, and some other companies. Chairman and CEO of the Asia Group Kurt Campbell said the companies want to learn about the investment climate and investment chances in Vietnam. Representatives of such firms as Google, AIG, Asia Pacific and VISA presented their investment in the country and expressed their delight at its reforms. They said the investment environment in Vietnam is increasingly attractive, which is a condition for them to increase investment. Dung noted Vietnamese Prime Minister Nguyen Xuan Phuc has created many optimal conditions for US businesses operating in the country.